Mindful of the needs of students, as well as employers in Florida, the state enacted a law in 2013 that makes it easier for students to choose vocational a trade education while they’re in high school. As a result, students can earn trade certifications as part of their diploma requirements and prepare for post-secondary vocational education. Key sectors such as healthcare, education, and hospitality and tourism in Florida have a high demand for skilled workers with post-secondary vocational training. This guide provides information about vocational education in Florida, including what programs are available and how they translate into employment after graduation. Students seeking professional training in Florida can find it at vocational and trade schools. Some of the more in-demand professional industries in the state include hospitality and healthcare, both of which can be found at most of Florida's career colleges, community colleges or trade schools. Schools in our rankings list include only those that are accredited and offer placement services to graduates. Florida’s Hillsborough Community College allows career development and advancement students a wide range of certification programs leading to the credentials they need. College Credit Certificates (CCC) are awarded for completing skills development training in technical fields. Postsecondary Adult Vocational Certificates are non-credit programs designed to build skills in a specific industry or business sector. Advanced Technical Certificate (ATC) programs are short-term (9 to 45 credit hours) certificates offered to students who have already completed an associate’s degree. Major certificate fields include studies in accounting, business, computer technology, culinary arts, gaming/multimedia production, drafting and design, criminal justice, allied health office support, manufacturing technology and sustainable design. Tallahassee Community College (TCC) is home to more than 35 certificate programs in pre-professional and vocational fields. Its strong suit is in criminal justice and public safety, where students can complete certifications in law enforcement basics, crossover from corrections to law enforcement, correctional probation, armed/unarmed private security, telecommunications, firefighting, and crossover from correctional officer to probation officer credentials. Other key certification programs are in CAD drafting, fire sprinkler design, health informatics, medical coding, health care (critical care transport, emergency medical technician/paramedics, pharmacy technology, diagnostic medical sonography), office administration, and computer networking. Students can apply online for admission and search for scholarships to TCC at the same time. Students interested in pursuing an allied health profession can receive the comprehensive education necessary for success from City College’s Altomonte Springs location. These vocational programs incorporate plenty of clinical hours into their curriculum to ensure that students get the opportunity to apply their knowledge outside of the classroom. Numerous other fields may be pursued, as well, in both associate’s and bachelor’s formats. By incorporating online or minimester learning, students will have the option to incorporate as much flexibility into their schedule as they may need. Transferring students may receive credit if previous classes closely resemble those offered at City College. City College’s Hollywood location is accredited by the Accrediting Council for Independent Colleges and Schools, and may award its students a number of associate’s and bachelor’s degrees. A student interested in vocational study will have the chance to learn their trade of interest at a lower cost and in a shorter amount of time, allowing them to graduate and start their careers as efficiently as possible. As all industries are constantly developing, City College is sure to keep the information administered through its programs updated and relevant for its students. City College’s career services are also available to aid students in their career search. Because the ultimate goal of attending college is often to get a good career, Charlotte Technical Center offers numerous vocational programs specifically designed to help students quickly progress through their program so they can start their new jobs. While much of the learning in a vocational program is provided through in-person, hands-on formats, there are certain classes that may be taken online, granting students the freedom to earn more credits per semester without feeling pressed for time. Winter and summer classes are also available to help students shorten the length of their college careers. In Florida, students can begin taking career and technical education (CTE) courses as early as the ninth grade, and continue that education through community college. There are several options for those seeking CTE training, including 718 public high schools and 63 community colleges in Florida. The vocational education needs of students can vary depending on what kind of career they’re interested in. This makes it important for students to choose the right school that provides the education to help them meet their goals. 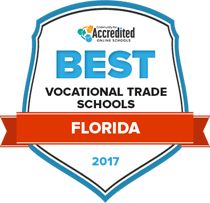 Use the search tool below to find the vocational and trade schools in Florida that are right for you. 97 percent of Florida’s post-secondary CTE graduates in 2013 found employment or an apprenticeship position, or joined the military. In the 2013-2014 school year, there were more female students enrolled in CTE than male. According to the U.S. Department of Education, 190,544 female students enrolled in programs during that year, while male enrollment was 185,565. The graduation rate for CTE students in public high schools was 92 percent in the 2012-2013 school year. Florida has 50 public high schools dedicated specifically to delivering career and technical education to students. On the secondary school level, CTE programs can be found in charter schools, comprehensive high schools, career academies, and early college high schools. Students in these institutions are able to earn certificates that are recognized by the industries they’re interested in joining. In addition, students who want to go on to community college can use their certification credits towards an associate’s degree. Those who have not enrolled in vocational programs in secondary school can pursue certificates or associate’s degrees at community colleges and technical schools around Florida. For more information about Florida’s trend in vocational certificates and degrees, review the table below. Healthcare-related positions are among the careers with the most jobs openings for Florida’s vocational and trade school graduates. Many of those who have completed post-secondary education pursue jobs as nursing assistants, licensed practical nurses, and medical assistants, while popular occupations for those with associate’s degrees include registered nurse, dental hygienist, and radiologic technologist. When these students graduate, they can pursue jobs in some of the fastest growing companies in the state, including The HCI Group of Jacksonville, iSirona in Panama City, and New Wave Surgical in Pompano Beach. The table below provides information on the vocational careers in Florida with the most annual job openings for students who have completed secondary and post-secondary vocational training. In addition, there is information on the earning potential for these workers on both the state and national levels. The life sciences industry is one of the most popular sectors in Jacksonville, with more than 50,000 employees working at medical services companies around the city—such as St. Vincent's Medical Center, Baptist Health Systems, and University of Florida Health at Jacksonville. Other thriving industries in Jacksonville include finance, insurance, advanced manufacturing, and information technology. For vocational and trade students in Jacksonville who want to pursue a job in the healthcare industry, there are several trade schools that offer the required education. For example, the CDA Technical Institute has certificate programs in health professions and emergency medical technology, and the Heritage Institute-Jacksonville has certificates and associate’s degrees in areas such as pharmacy technician, massage therapy, healthcare administration, and medical assisting. This page of the School District of Osceola County provides information on the areas of study for students pursing CTE education in Florida and the careers that this education can lead to. This site provides in-depth information on the key industries in Florida, such as aviation and aerospace, life sciences, defense and homeland security, and manufacturing. This non-profit group is dedicated to advancing career and technical education in the state by providing support to students, teachers, and administrators. The association provides CTE training materials and news about this area of the educational field. Provides employment projection data that can be searched by Florida counties and regions. This workforce education program provides assessments that allow job seekers to certify their qualifications in order to find employment. In addition, the organization works with educators to ensure that students are taught the skills that employers expect. Provides data on general Florida employment and employment in specific sectors, as well as wages, and unemployment in different regions. This study, conducted by the Center for Naval Analyses, provides information on CTE programs in Florida and their impact on different sectors of the state’s workforce.